Soon, train passengers travelling between Mumbai and Goa may be spoilt for choice: cuisine curated by celebrity chefs, tea and coffee vending machines and individual LCD screens. Railways will unveil a new premier train service between Mumbai and Goa in June with state-of-the-art facilities. The 20-coach Tejas Express will also have automatic doors and secured gangways for all coaches, a first for the Indian Railways. Currently, automatic doors are operational in Metro trains only, while gangways, corridors between coaches, are not closed from the sides. After the Mumbai-Goa run, the Tejas service, which was promised in the budget, is likely to be pressed on the Delhi- Chandigarh route. Since Tejas will be a new premier class train, there will be many facilities including tea and coffee vending machines, magazines and snack tables, said a senior Railway Ministry official. There will also be water level indicators in bio-vacuum toilets, sensorised taps, and hand driers. Besides choicest cuisine curated by celebrity chefs, there will be wi-fi facilities and toilet engagement boards. 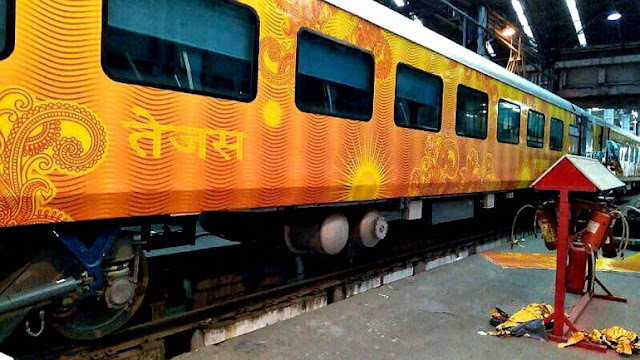 The train's interior colour scheme will match the exterior to give the passengers a feel of world class travel. 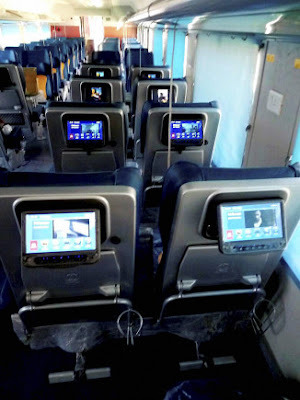 The LCD screens meant for entertainment purpose will also be used for disseminating passenger-related information and safety instructions, the official said. Comprising executive class and chair cars, Tejas coaches will be equipped with 22 new features, including fire and smoke detection and suppression systems and the improved aesthetics. The aim is to provide comfort to passengers in the inter-city journeys, the official said.